The great thing about alternative dimensions is that every now and again you can pluck a similar-looking cricket team from one of them and deploy it in your own world. The incarnation of the West Indies seen in this Test was an unusually gritty one. Like a team-mate’s belt within the trousers of Dwayne Leverock, it simply would not buckle. Rarely has the discrepancy between expectation and outcome felt greater. In their last match, they conceded 500 before shipping 19 wickets inside a day. Looking at the second Test scorecard, it gives the sense of an easy batting match in which England were hoodwinked by their own first innings incompetence, but that would be to overlook just how many chances were being created. 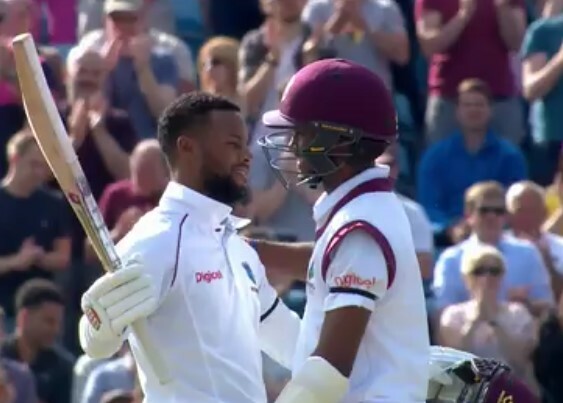 Set in that context, the sheer invulnerability of Shai Hope and Kraigg Brathwaite to England’s bowlers shines like all of Headingley’s floodlights an inch from your retinas. England defeats don’t come much more enjoyable or heart-warming. I wanted to see a list of highest successful Test chases at Headingley, but my google-fu was insufficient to find one. Did anyone else feel Jermaine Blackwood was showboating at the end by taking his helmet off and trying to get his face on telly? “Like a team-mate’s belt within the trousers of Dwayne Leverock, it simply would not buckle” is one of the greatest similies I have ever read. Two jaffas in one ‘over’. Not quite Willy Wonka’s golden ticket, but my ticket to Lord’s is certainly glowing. Shakib is the matchwinningest, but Australia are the howdidtheywinthatiest. It’s tense. A lot has been written about how enjoyable this result has been from England fans. I’m not exactly sure why. Is it just because it’s the West Indies? Don’t get me wrong, most of the time I support the underdog as much as the next man, but partisan considerations trump that every time. A lot of pieces penned seem to carry the subtext that this could be the start of a great West Indian revival. They’ve won Tests before, including against England a few years ago. They still went back to being crap afterwards. Meanwhile we have an England team with holes in the batting and an attack that looks decidedly fast-medium, ahead of a 5-Test series where they got whitewashed the last time around. The replacement bowlers are either a bit slower, injured, or a largely untested kid (Crane). And this Test was on the most Australia-like pitch of the lot. England lost, convincingly in the end, in a manner that speaks of more of the same to come. The West Indies won, convincingly in the end, and will no doubt go back to being total dross as soon as the net Test comes along. Speaking as an England fan who gets less partisan the older I get, there are so many reasons. It was a gripping game and it burrowed it’s way into my day to day life even though I didn’t watch a ball live; a bit of TMS here and there and lots of Crininfo refreshing. Also, there’s clearly a deep affection for West Indies cricket here and, like all the best Tests, it showed the character (both strong and not so strong) as well as the skill of the players. Both utterly unlikely and yet well deserved. And anything that may help, even in small way, keep Test cricket alive is what matters more than endless “winning”. Ultimately, it’s not the winning that matters most. I find the joy-by-proxy on behalf of another nation a little patronising, if I’m being honest. Largely ditto Bangladesh – 95% of my enjoyment of that result is seeing Australia plumb a similar new depth to us. It can be joy at competition. The first Test was not competitive and made it appear that the series wouldn’t be either. The second was competitive and so the series now is too. Even if you’re cynical about what happens next, a victory for the West Indies still brought more optimism about future Test matches than an England win would have done. Mike, with the West Indies it is sometimes the opposite of patronising – we half-expect them to be better than they are. I was young in the early 80s but I vividly remember watching Viv Richards et al and their seeming invicible. Apologies for the “it’s” in my earlier post. Grammar the casualty of excitement. Perhaps it is a little patronising, but many people are saddened by the decline of the once fearsome West Indies. In many ways they illustrate the ill effects vast amount of money and proliferation of T20 have had on test cricket and perhaps point the way to a bleaker future. So to see a fast bowler like Shannon Gabriel, and batsmen who can actually grit out a fifth day rearguard (a skill almost lost from test cricket), and then turn a probable loss into a win (again, largely lost to test cricket) is heartening. As is seeing sparks of life in a sleeping giant and possibility of a future where more than just four teams can win tests. It’s not simply joy-by-proxy, it’s actual joy: test cricket might not die! I agree that it would be good if Test cricket didn’t die. Not sure whether Shai Hope having his best-of-a-lifetime performance against England is going to be a significant factor towards that in the long term. In the short term, I see the benefits y’all have outlined, once the partisanness has worn off somewhat. In the medium term, I maintain that the Ashes look all the more frightening after this result. The Ashes being frightening is also part of the fun.